We believe in the long-term benefits of helping to develop our community's reservoir of knowledge. 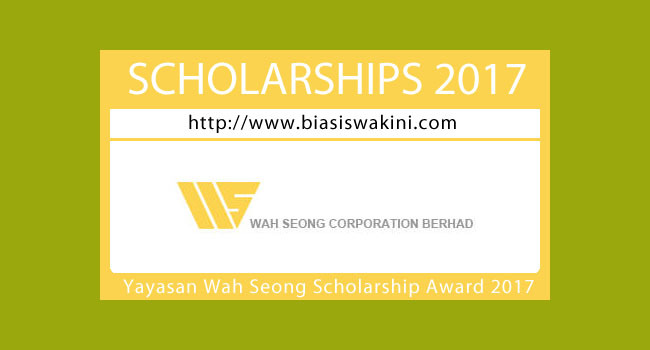 As part of our Corporate Social Responsibility, Wah Seong Corporation Berhad (WSCB), a leading oil and gas services group, is offering scholarships for full time diploma/first degree courses in Malaysian public universities/colleges through its Foundation, Yayasan Wah Seong (YWS). Scholarships are offered to financially needy and academically deserving students. Applicants who meet the eligibility criteria are invited to apply. Candidates currently studying, registered or applying to local public universities/colleges are eligible. Applicants must be Malaysians and demonstrate a continuing involvement in extra-curricular activities (team or individual sports; voluntary service; affiliation with a recognized association or society). The value of each award is subject to the course taken and will not exceed RM9,000 per academic year. Each award will be for the minimum period required to complete the course of study. 0 Komentar untuk "The Yayasan Wah Seong Scholarship Awards 2017"